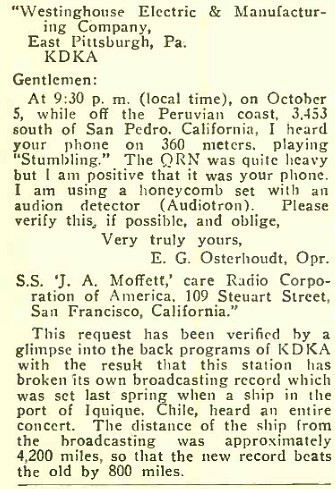 Before we go on, does anyone know where Elmer Osterhoudt was on the night of October 5, 1922? Anyone? Anyone? You there, on the computer! Stand up! Where was Elmer on October 5, 1922? ...That's correct. Very good. You may be seated. 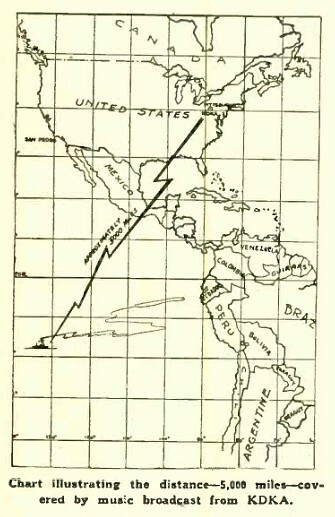 He was 3,453 miles south of San Pedro, California, aboard a steam ship named the J. A. Moffett. The J. A. Moffett, built in 1915 for Standard Oil of California. 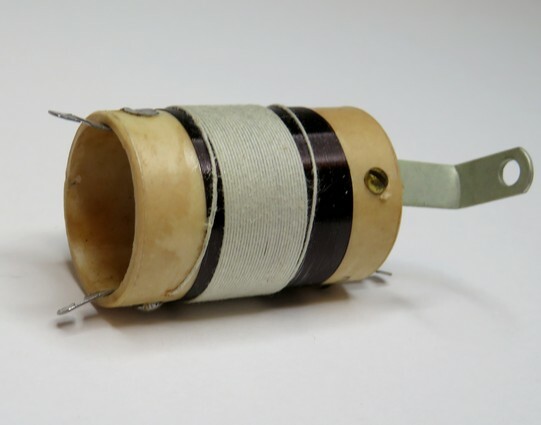 Elmer could send and receive Morse code at 30 words per minute. He could type 40 words per minute. The code didn't come to him easily. It took years on his own to reach 7 WPM. In 1919 he enrolled in the YMCA Radio School in Los Angeles and it took him a year of night school to reach 20 WPM. During his last FCC exam an inspector told him his sending was "lousy." He was not deterred in the least, he wrote that not a single operator at the school couldn't copy his code. 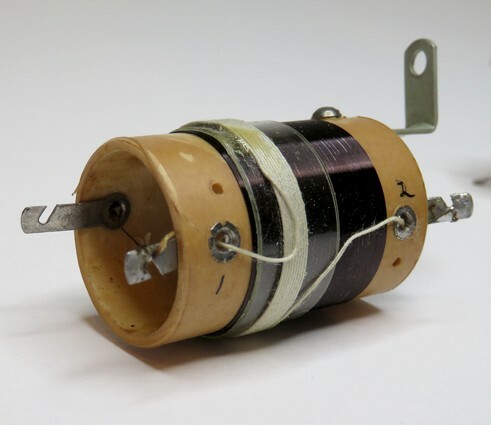 Back to the catalog, we want to build our first crystal radio and need a crystal and something in which to mount it. On page F-1 we find the crystals and stands. These pictures are very different than the others in that they show the stands at a slight angle. In the left picture, No. 1 is pure Elmer Osterhoudt. No. 2 seems to be a photo that he has gone over in ink; same with Fig. 3 on the right. 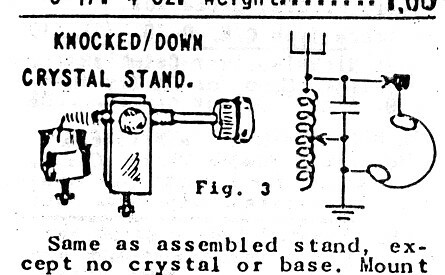 Knocked down crystal stand. Elmer sold these for 50¢. Today they are $55.00. 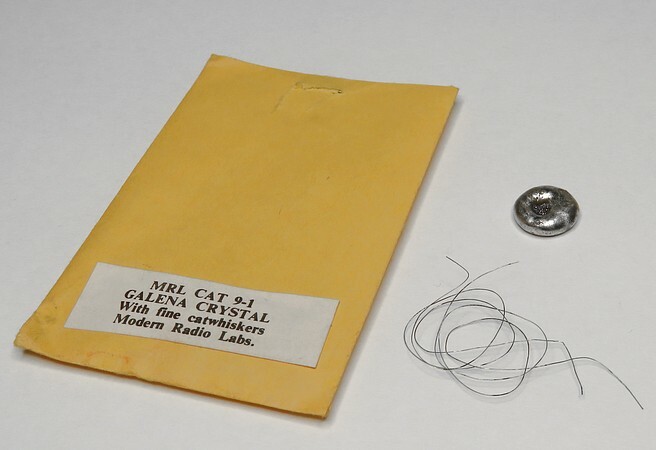 MRL crystal and cat whisker. 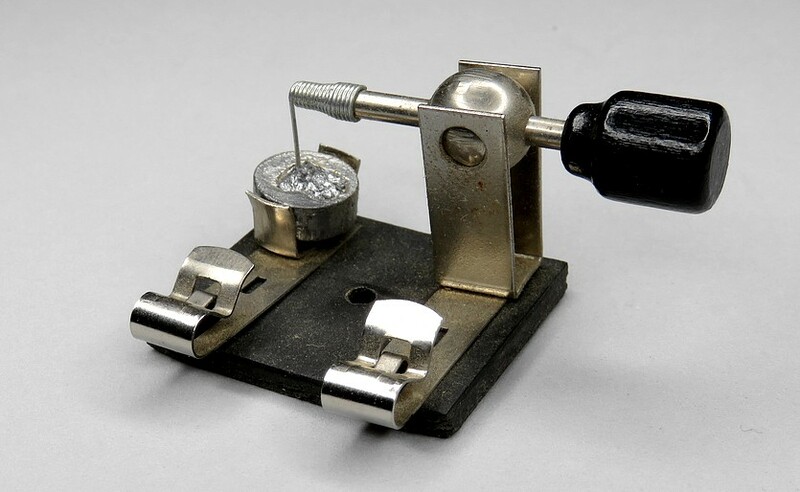 Elmer sold Steel Galena, Silicon, Iron Pyrites and Carborundum. 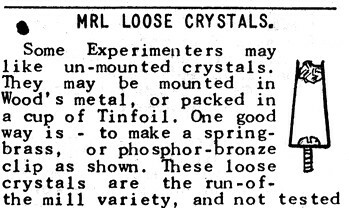 MRL loose crystals. The larger one is Iron Pyrites (fool's gold) the other is Steel Galena. 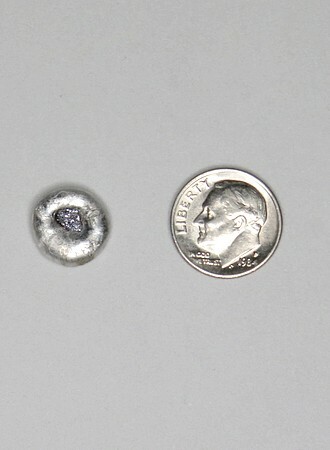 An MRL mounted Iron Pyrites crystal is shown for scale. 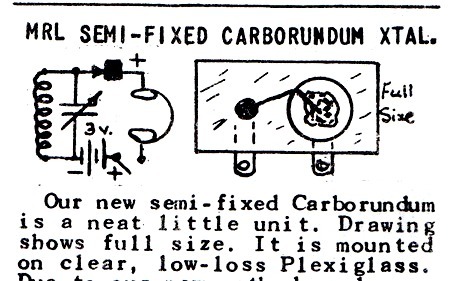 Here is the drawing in the catalog for the MRL Carborundum Crystal. One dollar in 1983. What does it look like in real life? 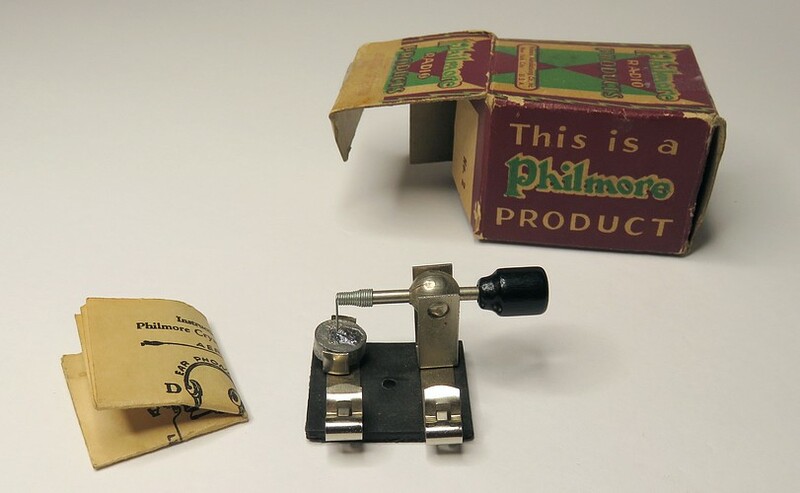 The piece of plexiglass is one inch long by one half inch wide. 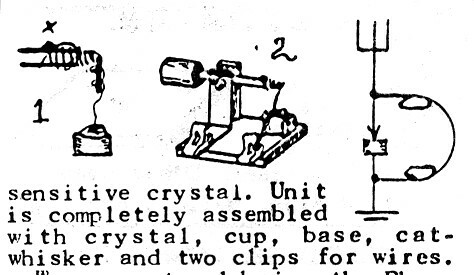 How did Elmer "fix" the cat whisker to the crystal? This catalog entry is unusual in that Elmer used a photograph. 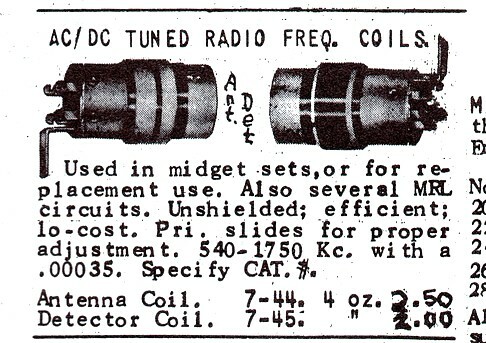 However, you didn't get the factory made coils shown in the photograph. 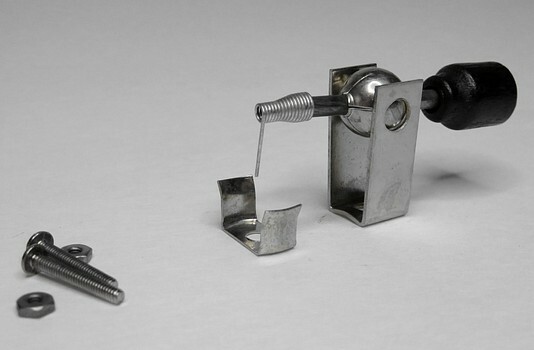 Instead, you got these cool MRL made coils. When they stopped being commercially made, Elmer just made his own! 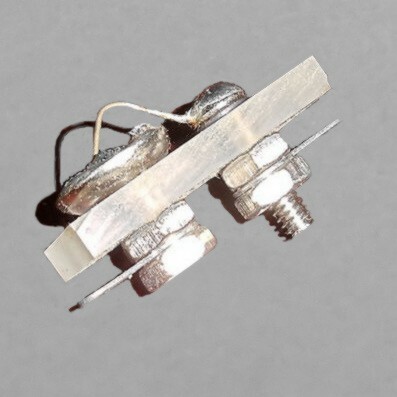 The reason for the cloth covered wire is for spacing between the turns. 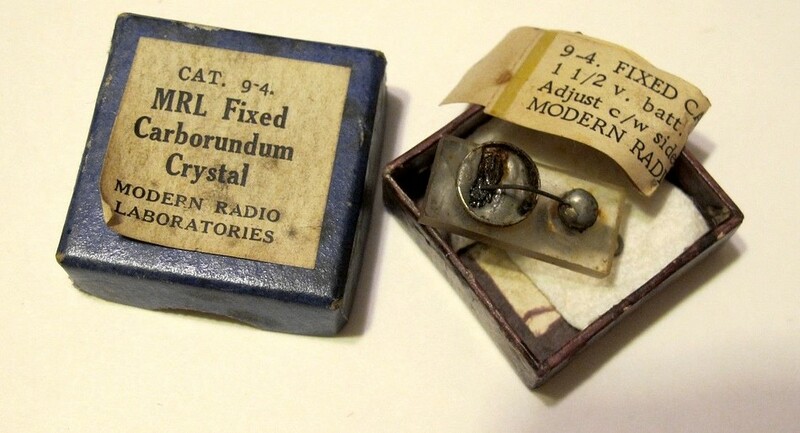 "I was 8 yrs old and read in the back of "Boys Life" that you could buy a Radio Kit for $3.75 from Modern Radio Labs. I looked at the Address and it was only a few blocks away. I had been working mowing lawns and the like and had the money and wanted to try it. So on Saturday I peddled to the address on Volata Rd. in Redwood City, Cal. and went back and forth But the address was a house. That confused a little boy, I was looking for Modern Radio Labs. Soon a Tall older man ( I was 8 remember ), came out and said "what are you doing" I told him and he said "you found it come on up." In those days garages were detached and two strips of concrete lead up to two doors that opened from the middle. 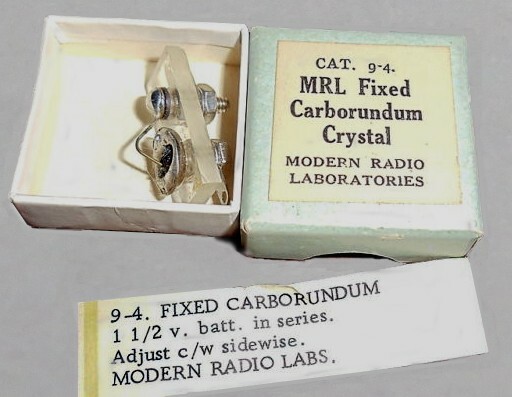 It was Modern Radio Labs. 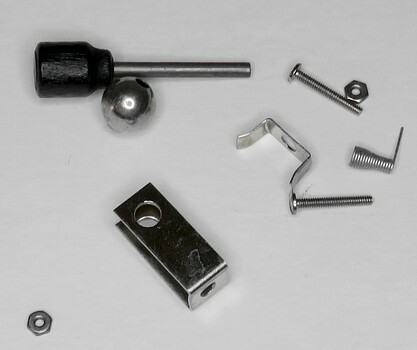 He had a work bench, with light bulb to control voltage and wires and all kinds of stuff I did not know what they were. He ask what I wanted and he pulled a box off a shelf and sold me the crystal set. MRL #1 Long Distance. I built it. It worked. It was magic. I still build Crystal Sets. And other Radios. When I was 30 I went to see him, He was quite old then. I bought one of every thing he had. Every Book, every note sheet and every kit. He died soon after that. Nice man. " 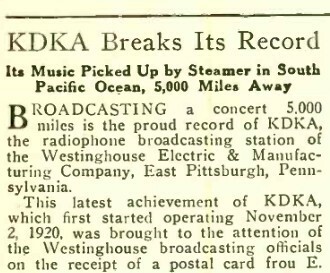 "So in 1952 when I went to see MRL it was at 1131 Valota Rd. 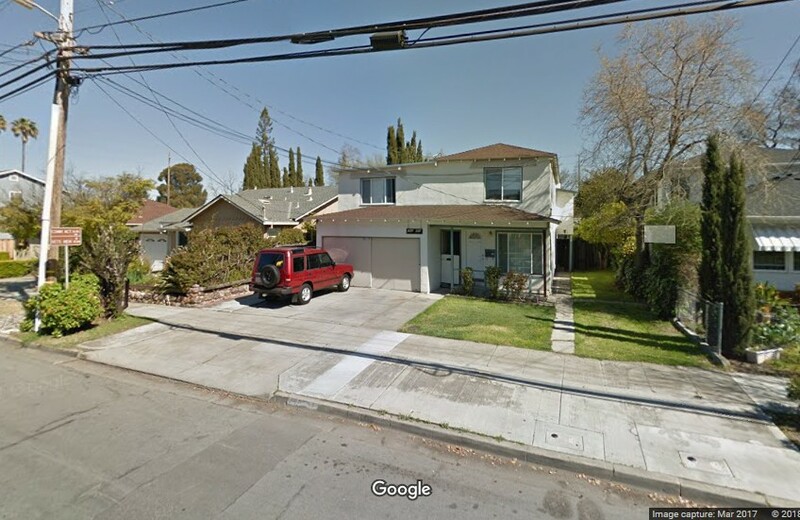 Later or before I don't know which, he was at 328 Fuller St."
Using Google Maps we can find the house on Valota Road. MRL was in that garage. In 1974 Jim bought one of everything Elmer had. Jim said Elmer was "quite old." Jim was 30; Elmer was 75.
copy at Mike Peebles' site here. 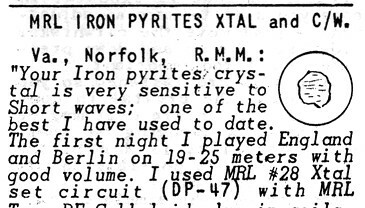 "I got my first MRL catalog in June 1969 or so, and maybe one additional from Elmer... not too sure. I still have every piece of paper he sent me. I met Elmer and Mabel at their Sacramento house sometime between about Feb 1970 and April 1970. I was all of 17 years old and a senior in high school, living near Auburn CA. His shop was astounding to me. I clearly remember his coil winder... and wondering if I could rig one up. He would have been about 69 or 70 then (which I will be in a few short years, hmmm). I bought everything he had I could find the money for... built a dozen or so Xtal sets. Still have my QRM coil that he wound. Elmer was gray haired, and I don't recall if he was balding or not. Mid height and build (sounds like a description Sherlock Holmes would disdain). They were very welcoming... we may have visited in the front of the house before the shop. My mental picture of the two of them is now almost blank. I recall many copies of the books and Detail Prints in a rack... 49 years ago - am I really that old? " Yes Dave, you are really that old, and part of the dwindling group of people to have met Elmer Osterhoudt.